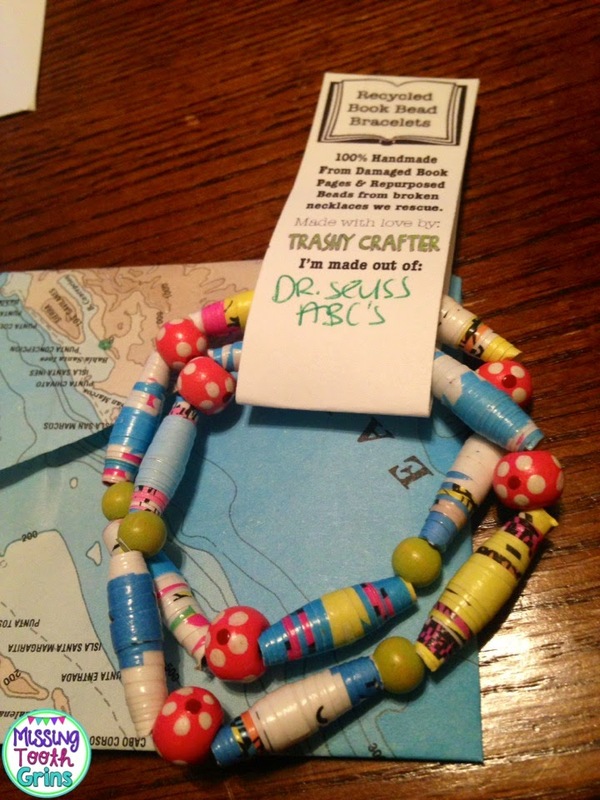 Trashy Crafter Review & GIVEAWAY! So, I received the most precious gift the other day. 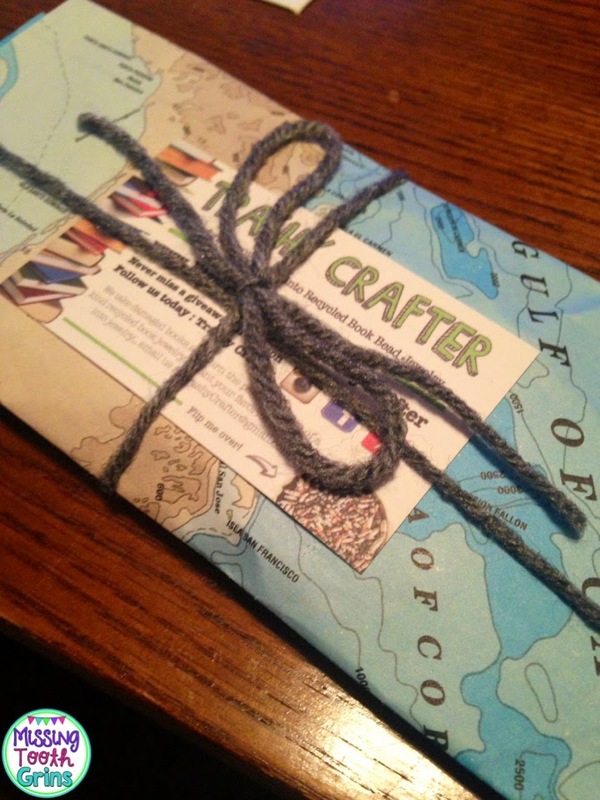 First of all, look at how this precious gift was wrapped. Right then and there, I know that something special is inside. 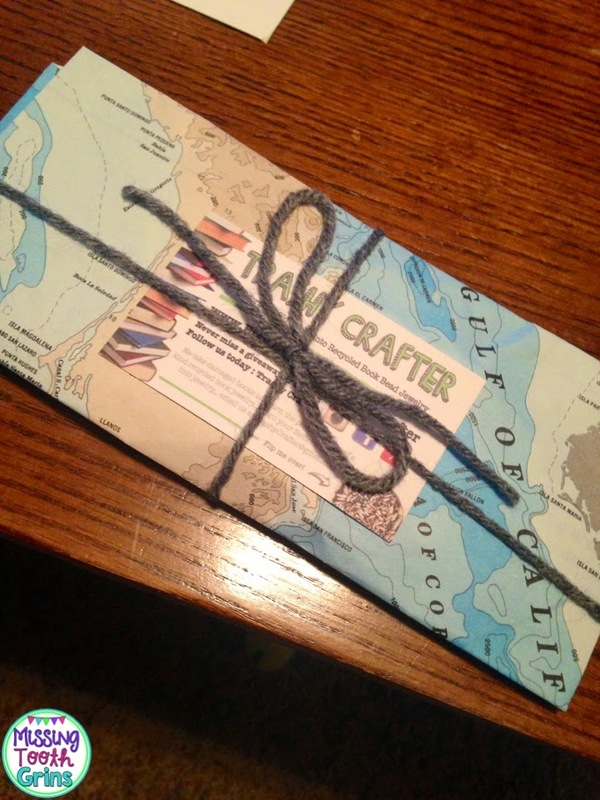 I really love the extra touch of the ribbon, but the map paper really sold me. My fun gift is from Kim and her mom from The Trashy Crafter. And look how cute and pretty! 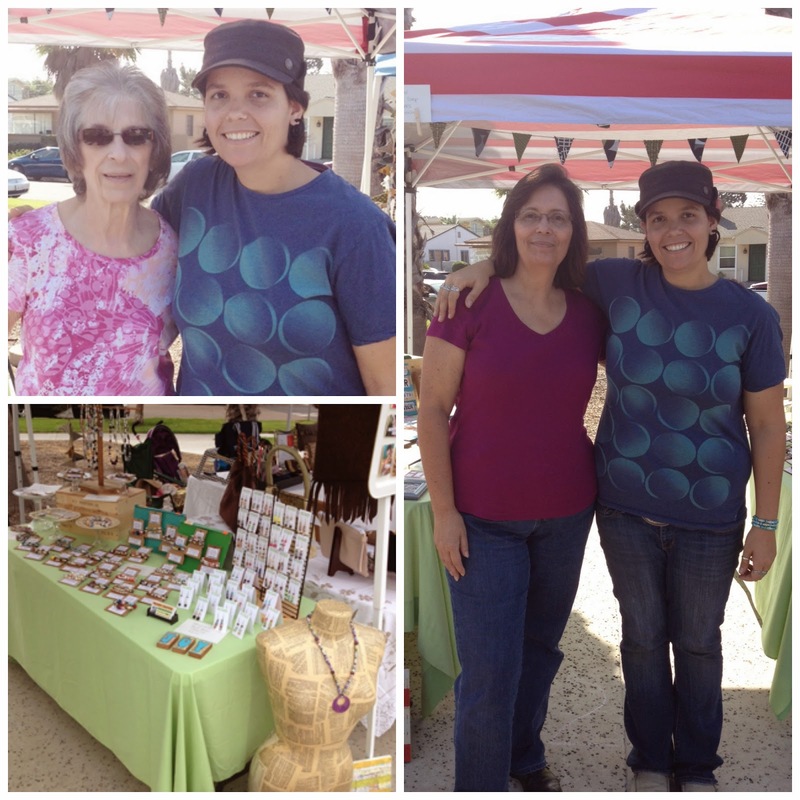 These creative ladies make bracelets from recycled books, maps, and sheet music! They handroll the pages into these pretty beads! 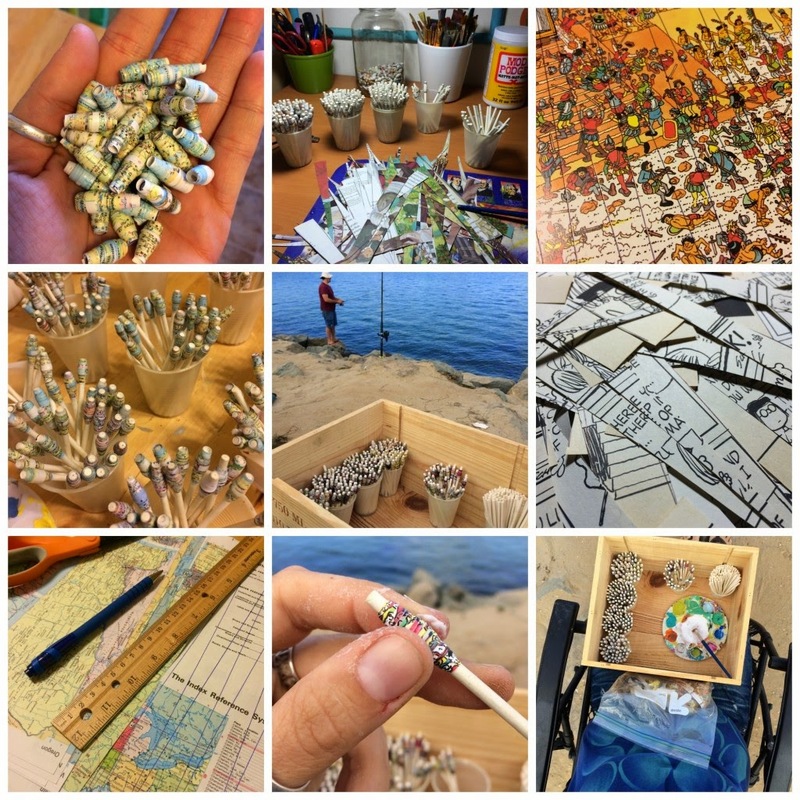 Not only are they beautiful, but they're creating these beads from books that were thrown away! I guess they saying is true, one man's trash is another man's treasure. And, I would say so because look at this beauty! I picked a Dr. Seuss book because he is one of our favorites in first grade. 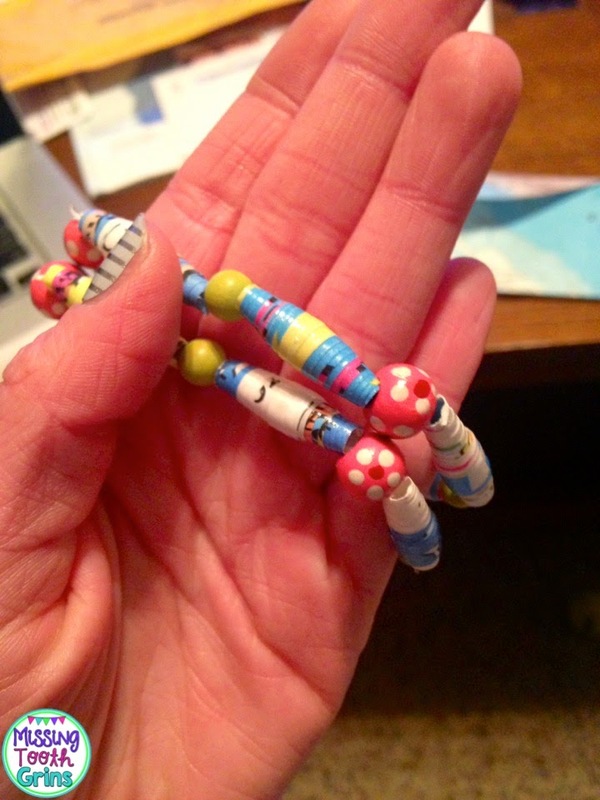 I was especially attracted to this particular bracelet because of the bright, vibrant colors. Looking at the bracelet, I feel like you can just tell that it's Dr. Seuss. Full of color! Plus, I'm slightly obsessed with the polka dot beads. How stinkin' cute, right? It really blows my mind that this beautiful bracelet is made from book pages! It's comfortable, slides right on, doesn't move around everywhere like many bracelets do, and is definitely unique and noticeable. My firsties noticed it right away and were in awe when I explained to them how it was made from an old book. They were especially intrigued when I told them which book and continued to ask me about all the different books that others were made from. 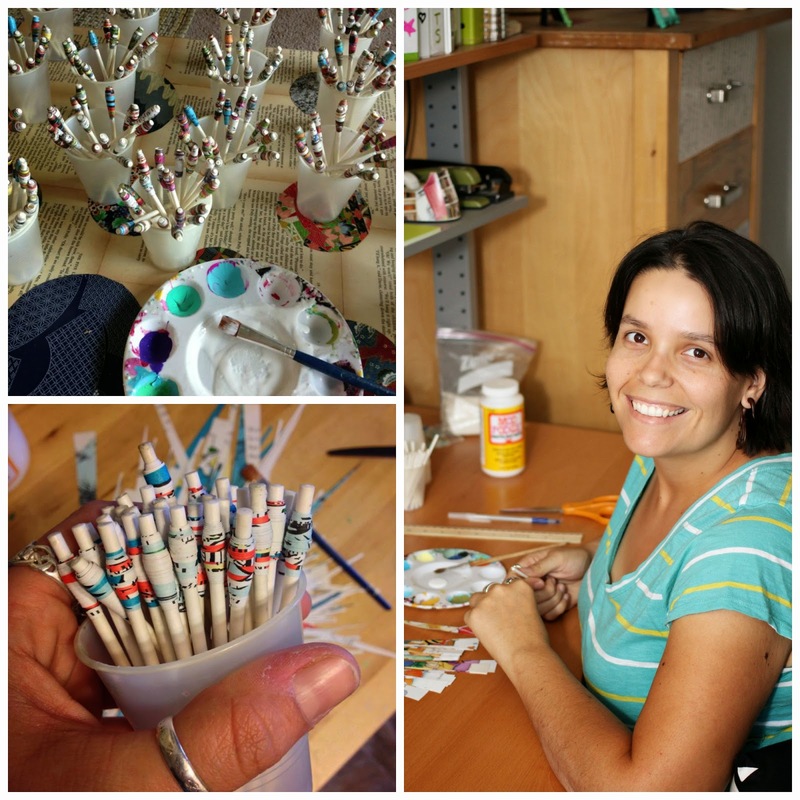 Just like the bracelets tell a story, Kim's story of how they started these bracelets is precious. Kim and her mom were at a local thrift store and found out that books that were not purchased because of being "too damaged" were thrown out, they were heartbroken. So, they scooped up about 25 of them and took them home. 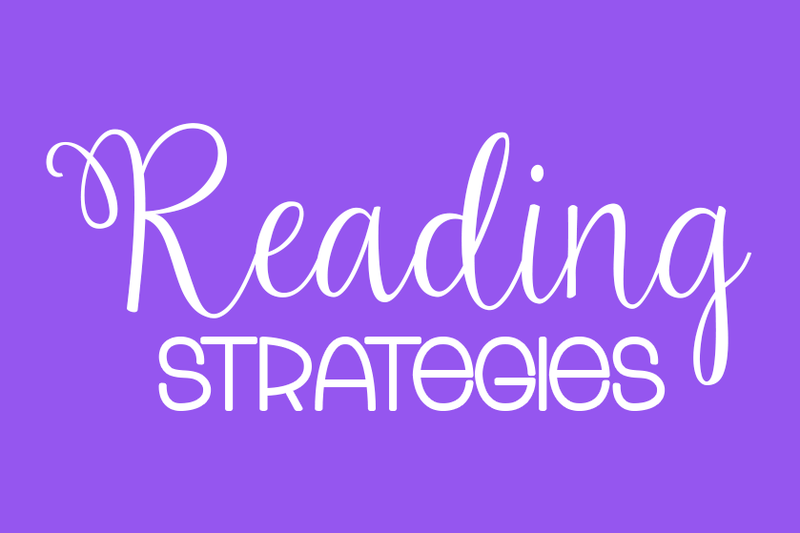 Three months later, her perfect idea came for these books! 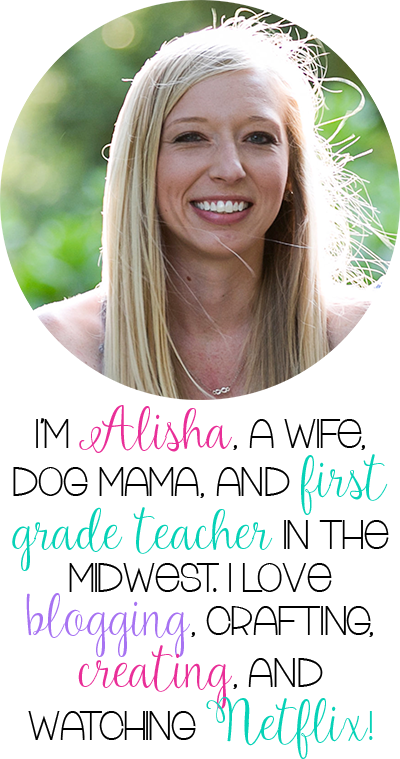 Her third grade teacher had taught her how to roll magazine pages into paper beads. 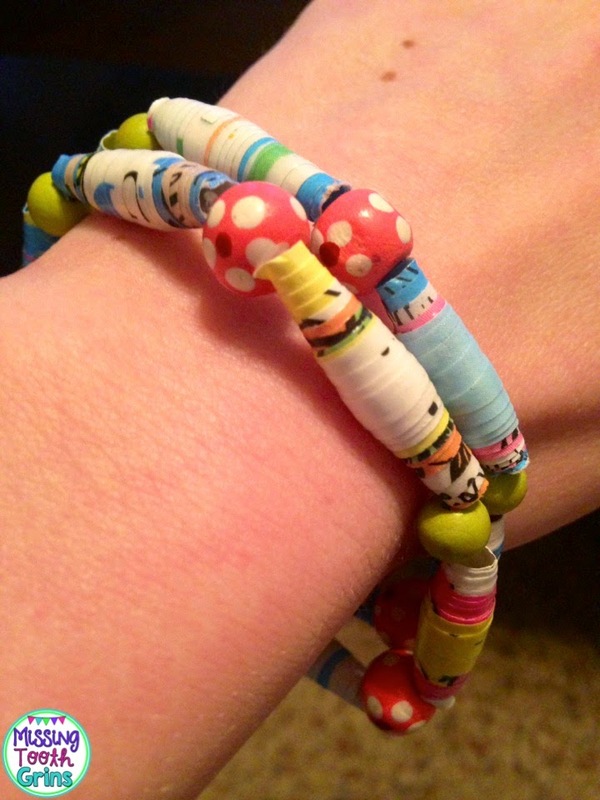 And, then these fun bracelets were created! 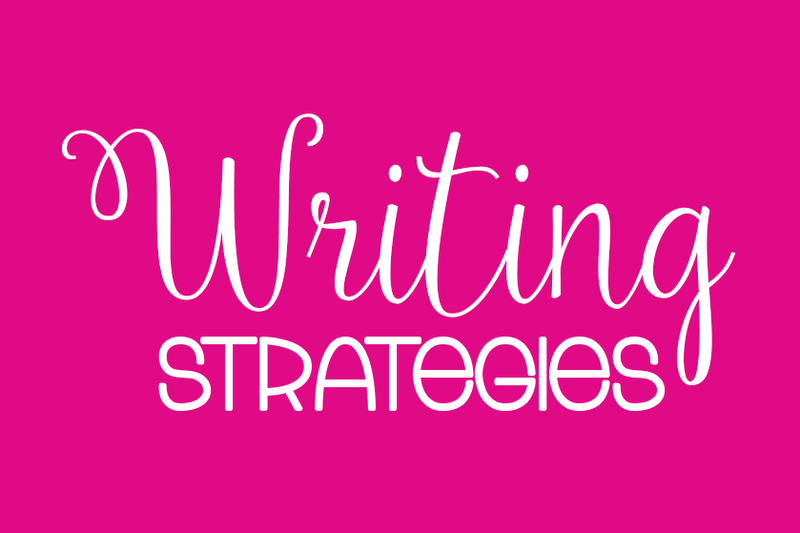 I personally think the process is pretty amazing! According to Kim, " My Mom Helen and I gather the books from a lot of different places, sometimes we find them in cardboard boxes outside of library’s, in thrift stores on the clearance shelf or in the bins, and even get books, maps or sheet music donated from folks that love and support our mission. Once we gather all of the books we measure and hand cut the book pages into long narrow triangle strips and roll them one at a time onto lollipop sticks. Once they are on there we coat each bead 3-5 times depending on the thickness of the paper. Once that is done we spray them with a matte finish and then we start to make them into the finished jewelry. 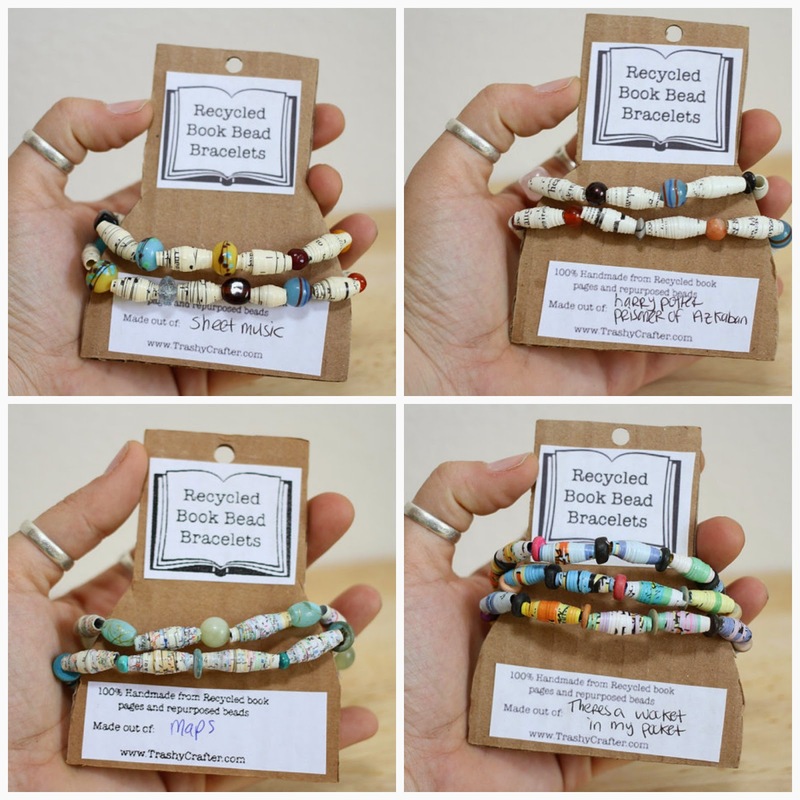 We purchase damaged necklaces and bracelets from the local thrift store and strip them apart to repurpose the beads. 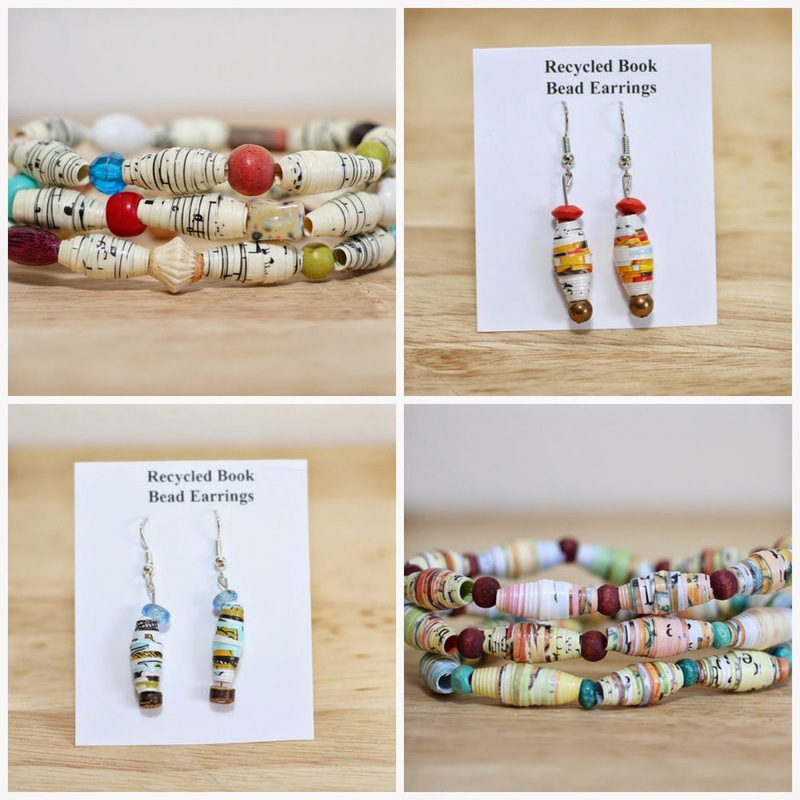 We create the jewelry with a mixture of the paper book page beads we made along with the repurposed beads. 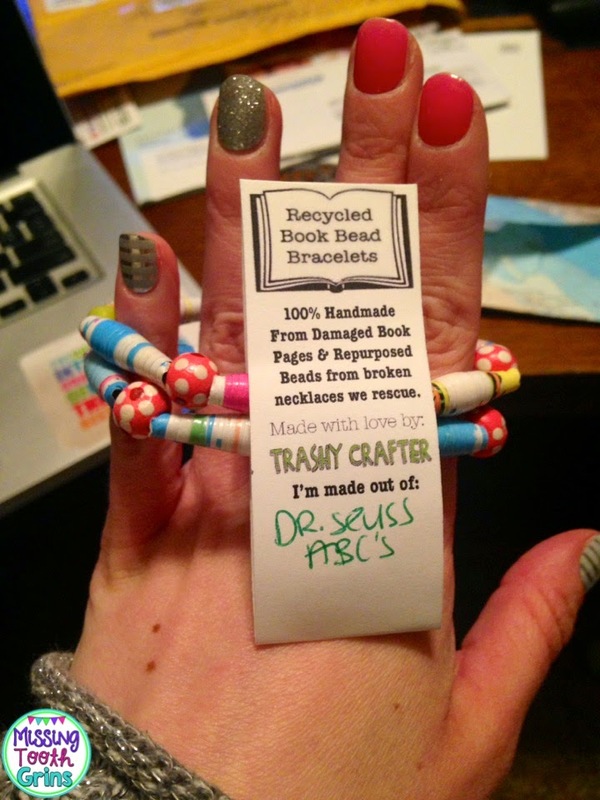 Once that is finished, we hand cut recycled cardboard bracelet holders and place the book labeling on to each set so folks know what book their bracelets were made from." Look at some of the other bracelets that are offered at their Etsy store! They make earrings too! How fun is that?! If you are in love like I am, make sure you head over to their Etsy store!! Here's the fun part! You have a chance to win a bracelet! Head to my instagram (@missingtoothgrins1)! On Wednesday (2/25) at 5:00 Central, I'll post a photo in which you will have to tag a friend and also follow Trashy Crafter (@trashycrafter) for a chance to win! So fun!! 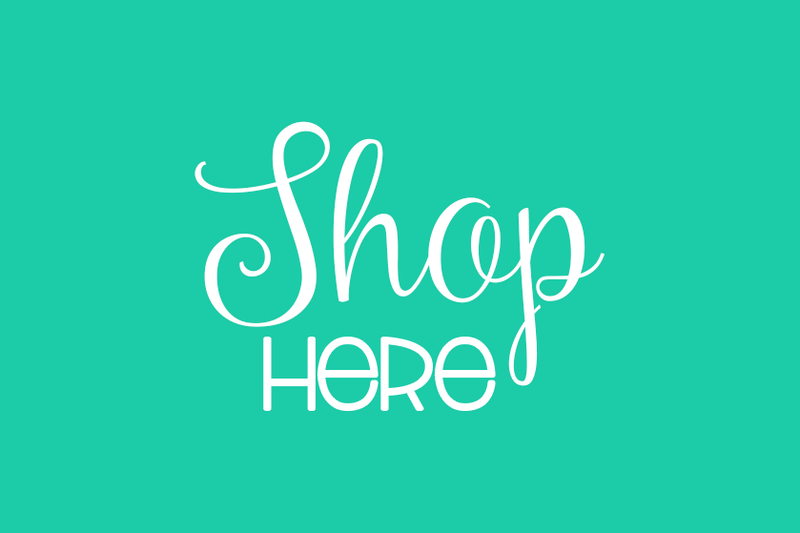 Now head to their store and get your wishlist on! !